LPDA-A-DT (Log Periodic Dipole Array – Active – Digitally Tuned) antenna is designed to operate over the 470–718MHz tuning range, the LPDA-A-DT consist of two components; the LPDA-P passive Log Periodic Array Antenna section and a digitally tuned Active Antenna booster. The LPDA-A-DT has 3-modes of operation and all these can be selected by the user to suit individual application. User selectable; digitally tuned booster mode, by-pass mode and a “true” passive attenuator mode. 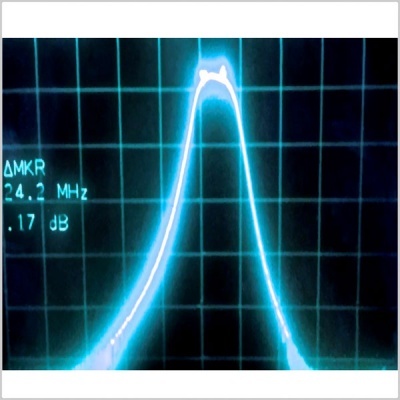 The booster section is a very highly selective digitally tuned band pass filter with 24MHz frequency window to reject all outer frequencies providing an excellent protection to the receiving system, the digitally tuned band pass filter is user tuneable in 8MHz steps via the OLED menu from 470 to 718MHz range. The active gain can be adjusted in 1.0dB steps to compensate long antenna extension cables. The booster section employs a very high dynamic range Low Noise RF amplifier offering a linear gain within the tuning range. In the By-Pass Mode, the active booster section is turned off and by-passed; offering passive gain of 6dB which is inherent with the LPDA design. In applications where attenuation is required, the mode can set into “true” Passive Attenuator Mode; as in the by-pass mode and up to 20dB of attenuation can be adjusted in 1.0dB steps to suit individual applications, in both modes LPDA-P frequency range extends from 400-1100MHz. The LPDA-A-DT’s unique design offers flexibility as well as additional front-end protection against interfering dirty RF, user adjustable gain to compensate long antenna extension cable losses hence increased distance between the transmitter and the receivers, finds its application in film making, documentaries, fixed installations as in studios, theatres and more. 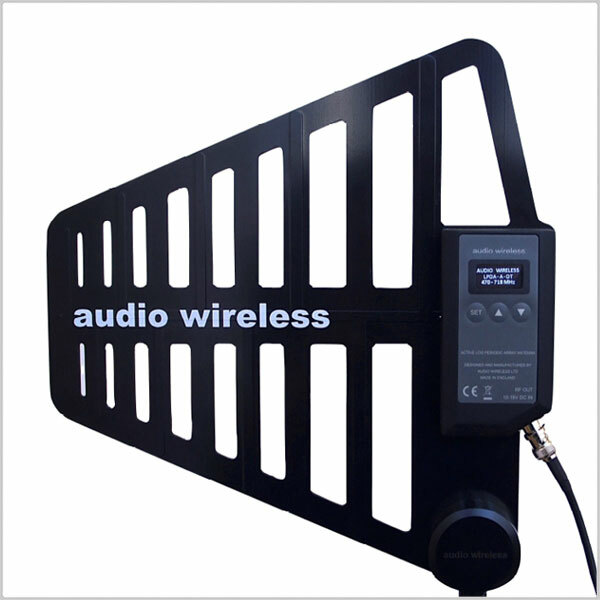 Compatible with any UHF wireless receiving systems (Digital or Analogue) providing a directional coverage pattern. The antennas are constructed using advanced multi-layer PCB designs technique with copper-clad epoxy fibreglass to with-stand heavy-duty use of harsh environment, providing long life and consistent performance under difficult operating conditions, the booster box is a custom design machined aluminium, black anodised with water resistant O-ring mounting. Mounting made easy with integrated thread that directly mounts on to a tripod or with a supplied adaptor mounts directly on to a microphone stand. Powering is through coaxial ccable power source of 10-18Vdc.